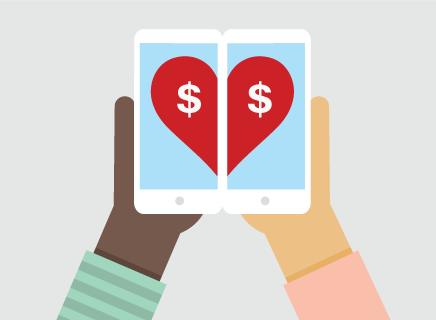 Get $50* from Verizon wireless by signing up as a new customer! All you have to do is follow this link and sign up as a new customer. Once you do you’ll receive a $50 Visa Rewards Card! *Referral reward is issued as a debit card and is available only to new accounts not receiving monthly access discounts that are activated within 30 days of receiving referral, and remain active and in good standing for at least 45 days. Only 1 reward per new account. Cards are issued by Citibank N.A. pursuant to a license from Visa U.S.A. Inc. and managed by Citi Prepaid Services. Cards will not have cash access and can be used everywhere Visa debit cards are accepted. What does using the Verizon referral code link get you? 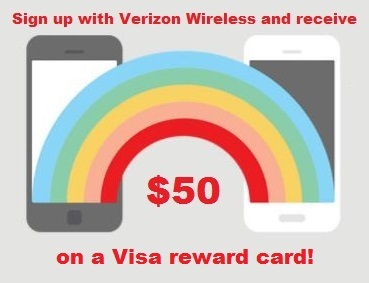 By using the Verizon wireless referral code link provided above, you’ll be able to receive a $50 Visa reward card for doing something you planned on doing anyway! 2. Just enter your email address and click the red continue button to get started. It will then show you another page with instructions on how to continue the process by checking your email and opening up the links provided by Verizon. Complete the process and keep your account activated for 30 days. That’s all there is to it! 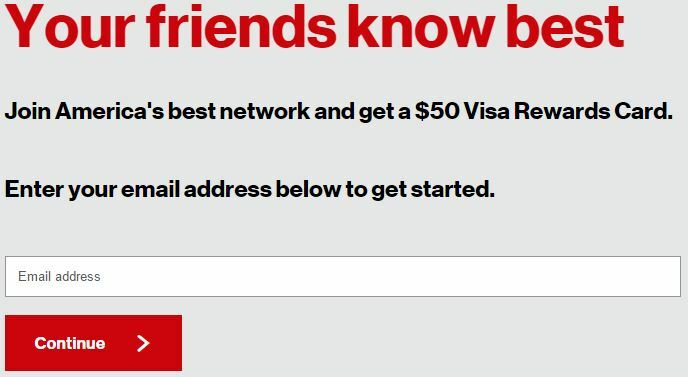 There really is no reason not to use this Verizon referral program reward link to get your $50 free Visa Reward Card. The card can then be used for purchasing a phone, accessories, or even your Verizon wireless bill! What could you do with $50? Here are our suggestions on how to use the Visa Rewards Debit Card from Verizon Wireless.